When I was a kid of about 12, I went through a Venus Flytrap phase. These awesome, incredible plants held endless fascination for a kid like me, who loves nothing more than to figure out how something works. Funny thing about the Flytrap is that scientists are still not entirely sure how the cells within the cavity help trigger it to close. This rare plant is one of a handful that are capable of quick movement. While they are amazing to watch, explaining the mechanics requires an in-depth, slow motion look, which is why 3D animations were a natural choice. Producers of “Animal Science” considered this plant exotic enough to include in their science series. 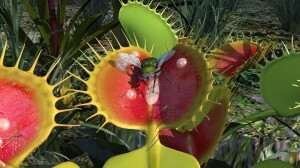 The story was about what’s going on inside the plant as it snaps shut and traps the insect. No camera on the planet was going to be able to take the audience there. The process takes place on a cellular level and is so complex that scientist are still making discoveries about it. We were able to create a beautiful, realistic image of this plant, while at the same time, show how the mechanism works and create graphics that make it very clear and fascinating to watch. Television is a visual medium, that has the opportunity to engage viewers and help them explore and learn about our world. There is nothing wrong with entertaining an audience once in awhile with unscripted social experiments, but programming that triggers cognitive interaction is a critical component of this medium of communication. While certainly not without intense challenges, this animation was a joy to do, taking me right back to a few of my best memories of childhood. And, it made for a much more exciting video production. A a win, win.